January 2019 - WOW! The Blues Corner radio show in Portsmouth, England selected my song "You've Still Got It" as one of their 2018 Picks of the Year. Thanks to DJ Tony Corner for airing my songs in the UK! September 2018 - "You've Still Got It" was the featured album on the "Bluegrass in the City" radio program in Queensland, Australia! Thanks to DJ Mike Russell at KKUP in Cupertino, CA for the live interview with me on his radio program this month. July 2018 - My new CD "You've Still Got It" has been getting airplay on radio stations from Virginia to California, and abroad as far away as Sydney, Australia and Paris, France! Thanks to the DJs who are playing my music.!! ​May 2018 - My new CD "You've Still Got It" has been released!! It is available for sale on iTunes, Amazon, CDBaby and of course directly from me. For information on ordering the CD from me, send me a message via the Contact link on this website. January 2018 - We had a blast recording my 2nd CD in Nashville, TN with some incredible musicians: Jim Van Cleve (fiddle with Josh Turner), Aaron Ramsey & Seth Taylor (of Mountain Heart), Russ Carson (banjo with Ricky Skaggs). It's always great to record vocals with Paul Muller and Brian Muller. ​January 2017 - Three of Damian's songs were recorded by Southern Rail on their new "Voices In the Wind" CD. The songs are: "A Common Prayer (The Lottery Song)", "Rebel Ghost", and "Who Has Known". Southern Rail is New England's premiere bluegrass band. Damian Muller is a singer-songwriter from the Richmond, Virginia area. He brings a unique and refreshing program of original and uplifting songs that will touch your heart. 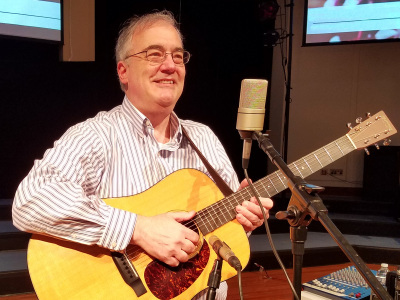 His songs are inspired by real-life experiences of faith, family and fun. Damian’s songs have been recorded by multiple bands from Boston to Tennessee. His “Steady Work” and "You've Still Got It" CDs of his own songs have received radio airplay on folk, bluegrass and gospel programs across the country, and internationally as far away as Australia and Paris. Damian’s songs are guaranteed to make you laugh, sometimes cry, and always smile!